Are you thinking about transferring to a University? How do you know if you are meeting the requirements? Family, friends, faculty, staff, and community members gathered for the grand opening of the newly completed administration building on Friday, October 19. President, Michael “Mickey” Parish discussed the collaborative effort that was involved in the planning and building process and thanked those who participated in bringing the vision to life. There is now a new Withdrawal Request Form available for online and on-campus students. Construction of the new Administration/Classroom Facility is underway. The new facility has three floors counting the basement and is a total of 37,300 square feet. 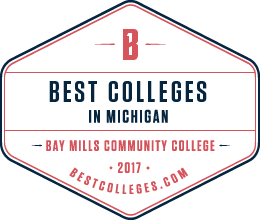 Bay Mills Community College Named One of the Best Community Colleges in Michigan by BestColleges.com. BestColleges.com rankings shine spotlight on leading two-year institutions in Michigan, and we made their rankings! Free Tuition for Summer 2017 through the Board of Regents Tuition Award! The BMCC Newsletter Committee makes every effort to increase communication within the college community and make everyone aware of the programs and events taking place on and off campus. The newsletter is distributed every other month during the academic year throughout the campus and the community.